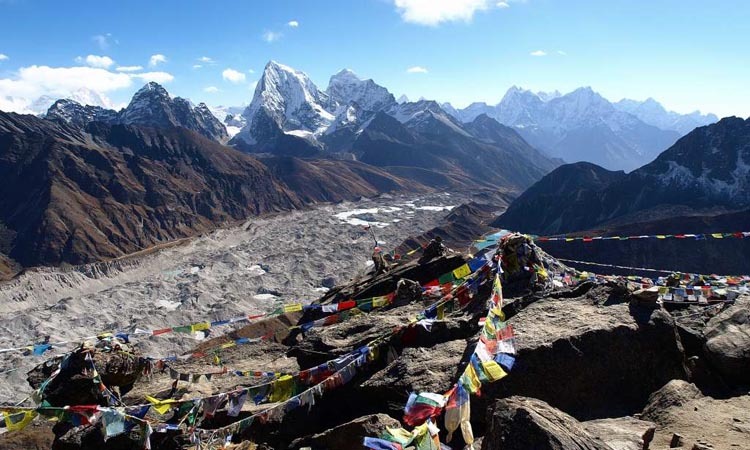 The trek of a passionate trekker is not complete without Gokyo Ri and some of the highest fresh water lakes in the world situated idyllically in the Khumbu region of the greater Himalayan range, in the vicinity of the world’s highest peak, Mount Everest. 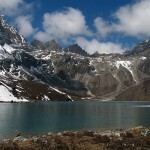 Besides the exacting trek that all trekkers look forward to, the Gokyo trek is coveted for, by those who have been there, as one gets the unscattered view of not only the five lakes of various sizes, but also to trek up to Gokyo Ri (small peak in the local dialect) where the bonanza is a circuitous view of a number of peaks such as Cho Oyu, Gyachung Kang, Lhotse, Makalu, Cholatse and Tawachee, and what more, Mount Everest from a north western angle. 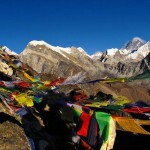 The crowning glory of it all, is that, it is less frequented by other trekkers. This is the reason, the Brahminy Duck has made home in the lakes for years. 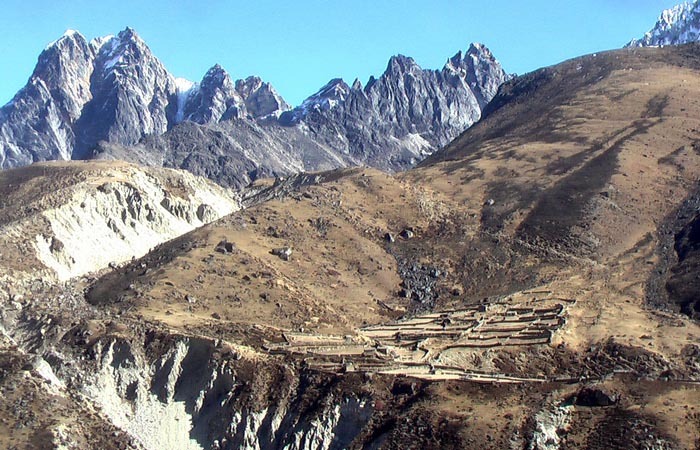 The Kharkas (small pastoral lands) which dot the Gokyo valley trek. Not to forget the cave where you get the first view of Gokyo lakes. 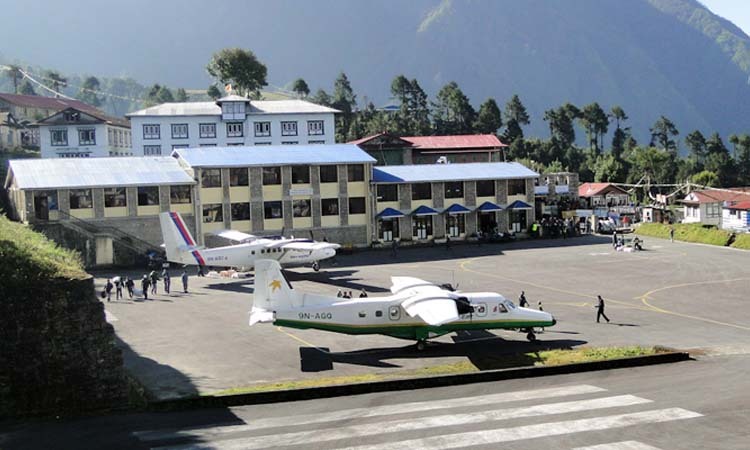 This fourteen day trek, starts from the moment you land in Lukla an airport. 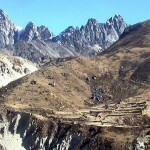 You begin down a trail to Pakding and then to Namache Bazaar, a marketing hub and a central town for the Sherpa community. All along the way, you seem to be greeted by boulders and waving flags with prayers inscribed on them. 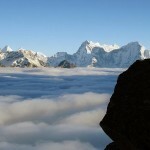 It is here you are made to adapt to the high altitude for a day or two. 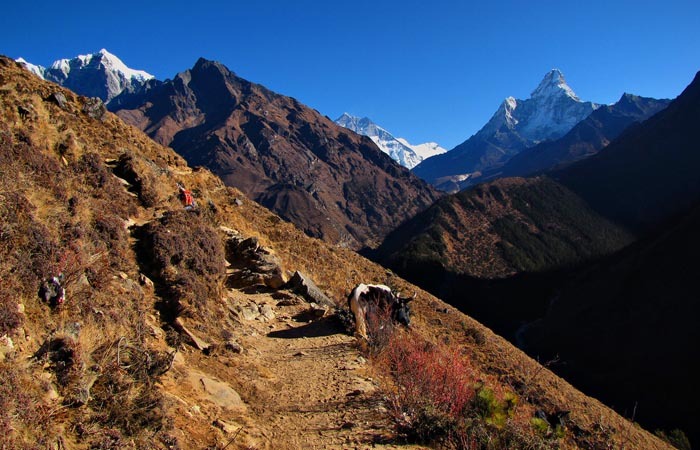 Following this, your start your trek in earnest and it may seem that you on the way to Everest Base camp, but a short while later you are diverted along a trail to Phortse Thanga, all the while giving you a view of Dudh Kosi River. From here, it is all the way to Dole. As your ascent takes you higher, the fragrance emitted from the juniper and conifers hasten you on. Don’t we love the tales of the Yeti. 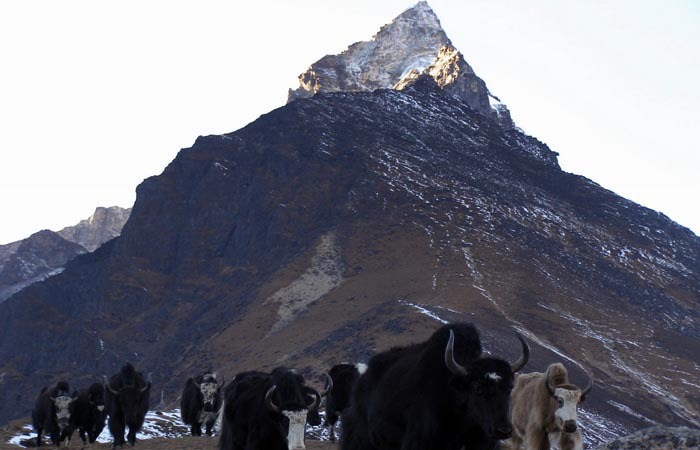 It is supposedly believed that three yaks and a woman were the prey upon. You are on your way to Macchermo. 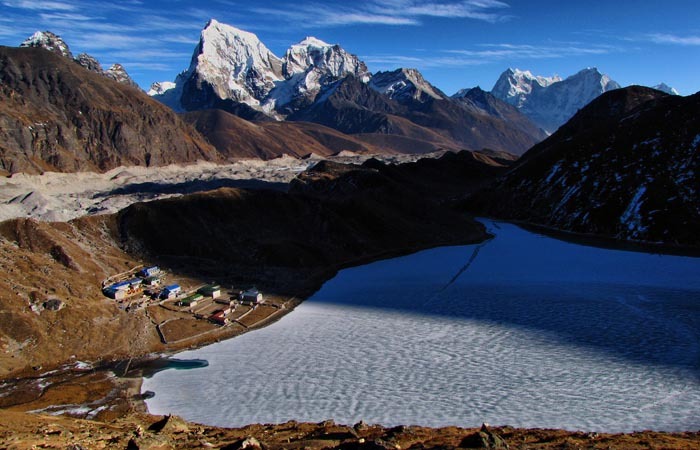 Finally, it is Gokyo valley where you need to acclimatise for a day without boredom for the beauty of the five lakes are there to enthrall you. 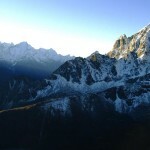 Then it is your trek from Gokyo valley to Gokyo Ri to view the Himalayan peaks. 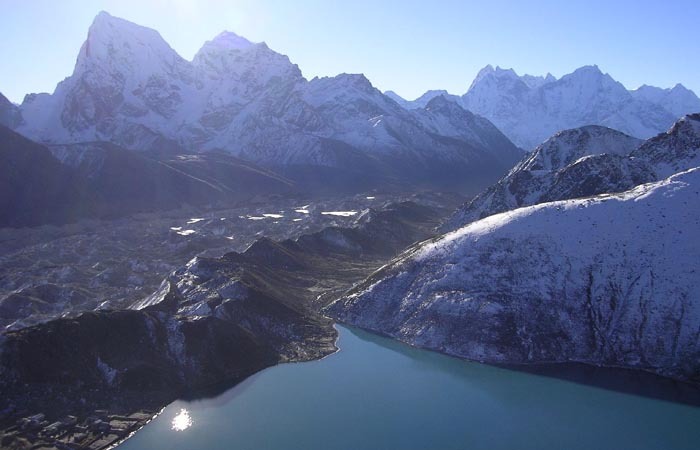 The Gokyo valley trek back to Namache Bazar and then to Lukla happens quicker than your Gokyo lake view trek. 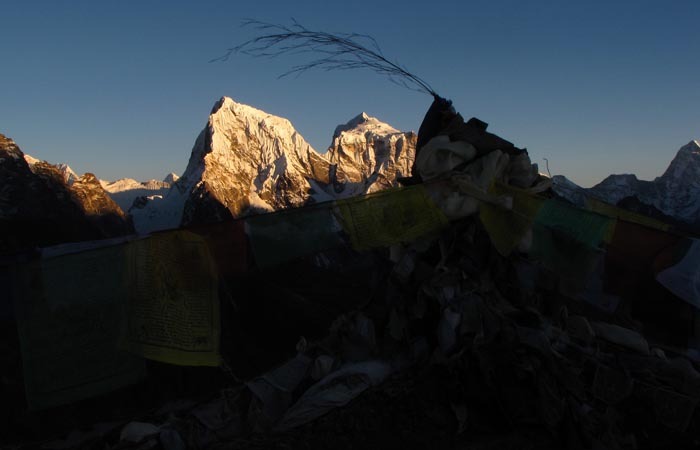 We follow the main trail to Thyangboche as it bends around the hills and branch off on a short climb on the side of the sacred peak, Khumblia(5761m). 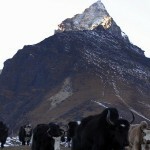 We pass for some time through pastures of Yaks and we slowly climb to Mon La. 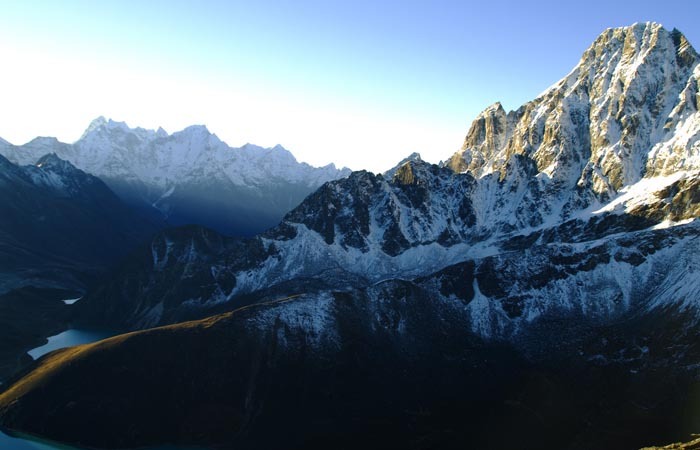 We can view the confluence of Dudh Kosi and Imja Khola and on the other side of the valley is the Thyangboche monastery in the backdrop of Ama Dablam and Kantega. On reaching a stupa draped with flags on a ridge we begin to move down through a forest to Dudh Khola. 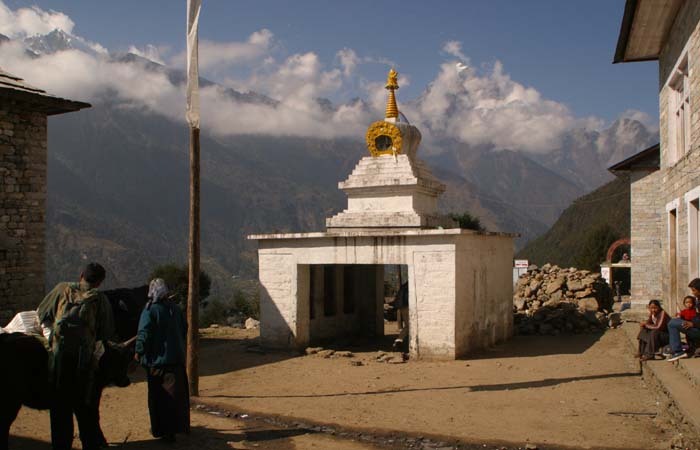 After Afternoon tea a walk up the ridge will bring us to the village of Portse Thanga. 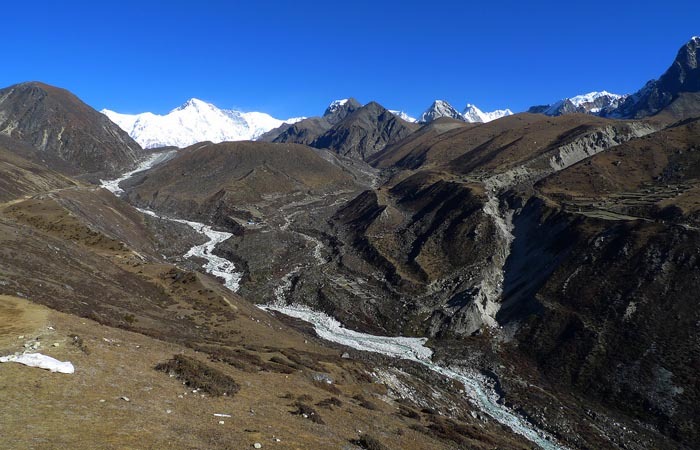 Heading north, we follow the Dudh Kosi to its source, the Ngozumpa Glacier. 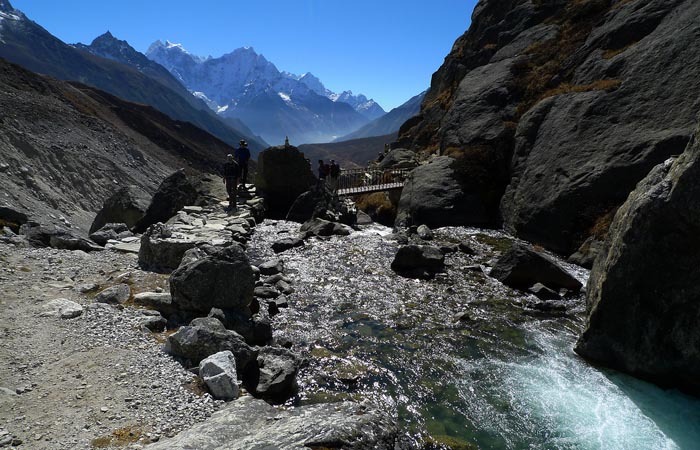 A short climb gets us on a steady course towards Gokyo. 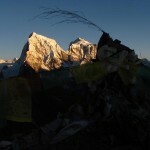 After leaving the mail trail, we see less trekkers and locals and are a pleasure. 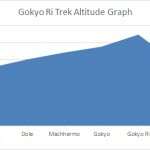 Sections of the trail are perched with red birch, fir and dwarf rhododendron forest and yak pastures as we gradually gain altitude. We pass pleasant waterfalls and have time to gaze at the glaciers flowing from Taweche and Cholatse on the opposite of the valley. Behind us are the peaks of Khumbulia an others that reach almost 6,000m. We finally settle for the day at Dole beside a stream with Kantega and Thamserku in the distance. 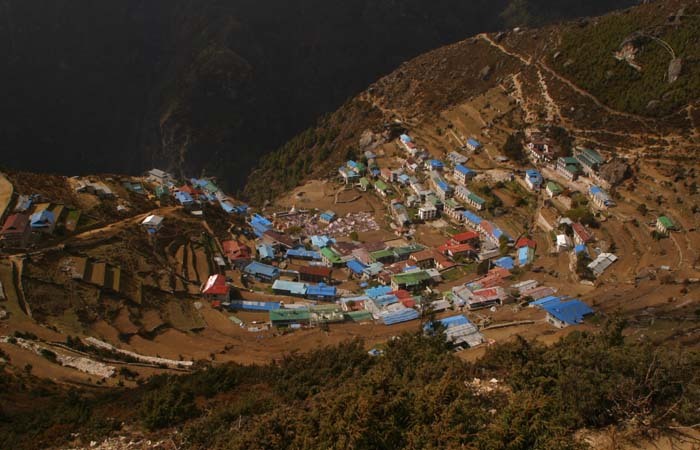 A Trek at a constant but steady pace would get you to the village of Machhermo in time for Lunch with a few buildings. 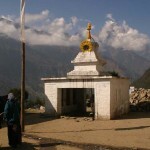 People from Khumjung and Khunde own land up here which they used grazing yaks here in summer. 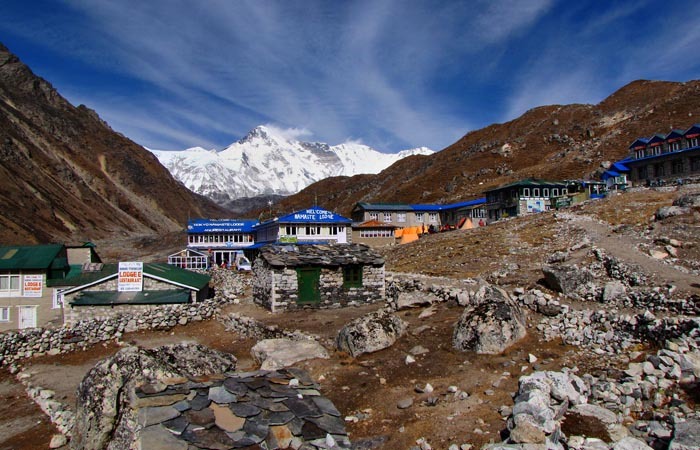 This place is best for getting acclimatized for the higher altitude and the ascent to Gokyo Ri(5483m). The afternoon can be used for relaxing or to stretch your legs Machhermo Porter Shelter and Rescue Post. 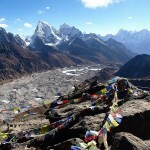 Trekking above we finally ascend to the village of Gokyo. 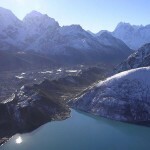 We get wonderful views of Cholatse at the village of Pangka. 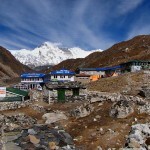 We are now high in Alpine country as we approach Ngozumpa Glacier. We trek onto Moriaine. 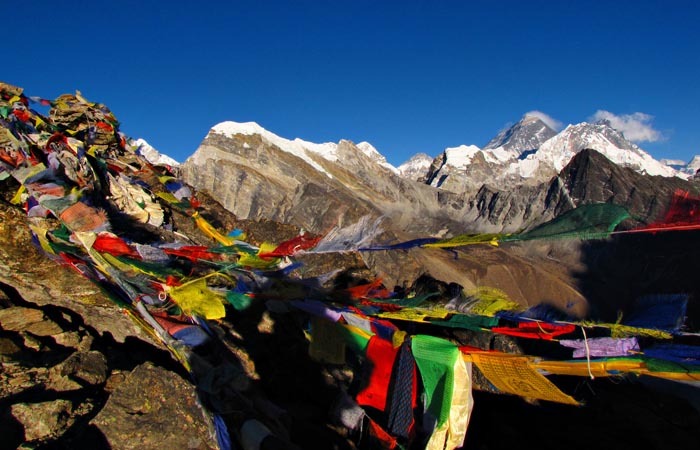 We also enjoy excellent views of Kantega from the south and Cho Oyu from the North. 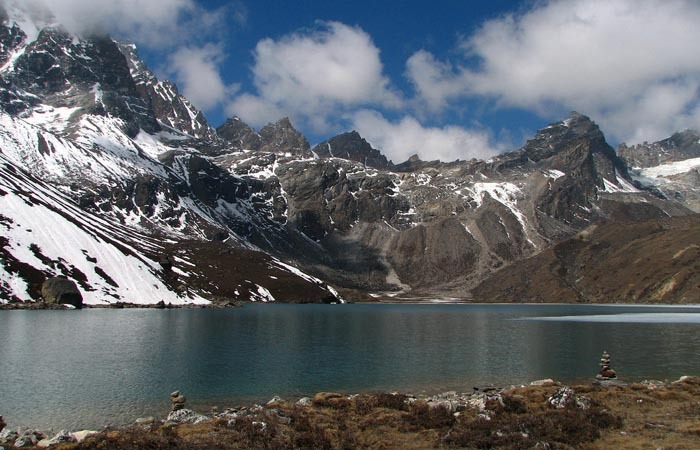 Once we ascend the snout of glacier, we pass the first lake, Longpongo, before we reach the second Taoche Lake, where ducks are often seen swimming in the frozen lake. Walking up parallel the Ngozumpa Glacier is the massive lateral morine. 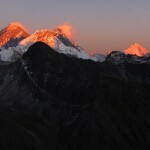 An early morning start is best to Gokyo Ri which is a steady and unrelenting. 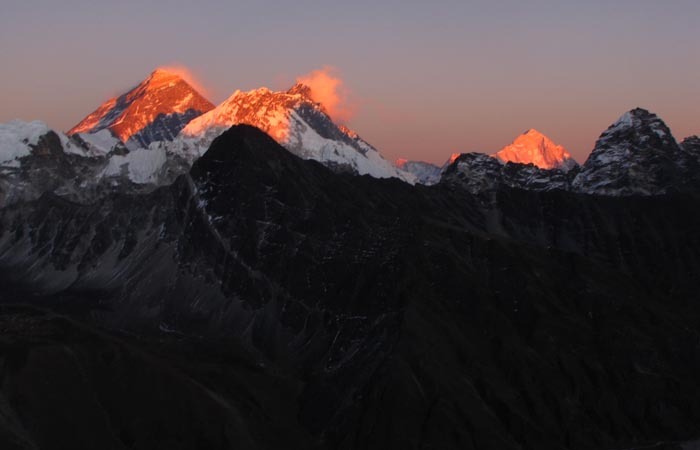 You will exuberant on reaching the summit with the spectacular view with the comprehensive view of 8,000 metre peaks in Nepal – Cho Oyu(8153m), Gyangchung Kang(7922m), Lhotse(8501m), Makalu(8475m), Cholatse(6440m), Taweche(6542m), Kantega(6685m), Thamserku(6808m), Lobuche(6145m) and Mount Everest(8848m). 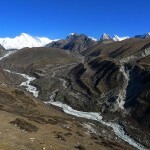 Further below is the largest glacier in Nepal, Ngozumpa Glacier. 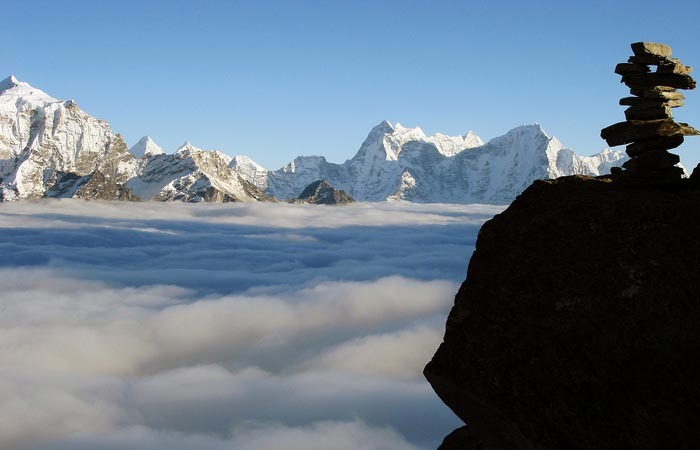 Here we get to view the entire expansion of the Himalayan range in relative peace. 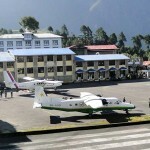 Kathmandu-Lukla-Kathmandu airfare ($322 per person). 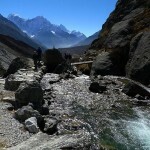 On trek meal (allow US $20 to $25 per day).